Motorcycles are not motor vehicles! At least, that is what the Michigan legislature has decided and said so in the Michigan No-Fault Act. In an attempt to exclude motorcycles from the benefits that come with the Michigan No-Fault Act, the legislature redefined what a motor vehicle is and that definition did not include motorcycles. Motorcycles represent an exception to the rule under the Michigan No-Fault Law. For instance, a motorcyclist cannot purchase normal Michigan No-Fault insurance, but they can purchase insurance to protect themselves in the event of an accident. This involves purchase of specific limits for medical and wage insurance that they can procure from their insurance agents and the companies they represent. More importantly a motorcyclist must, by law, carry insurance known as personal liability and property damage (PLPD). Motorcycle enthusiasts must take note that even if they decide not to purchase medical coverage insurance on their motorcycles, they must carry PLPD. There are severe penalties to the motorcyclist who does not carry such insurance. They include criminal penalties, and the inability to sue a negligent driver of an automobile or a truck who strike them causing severe injuries. In addition, without having PLPD insurance, the motorcyclist is precluded from collecting Michigan No-Fault benefits, and this represents the greatest anomaly in Michigan No-Fault Law. The motorcyclist is prevented from purchasing normal Michigan No-Fault which would cover them if they were injured by driving off the road or striking a telephone pole, etc. However, if a motorcyclist is injured by a “motor vehicle”, such as an automobile or truck, and they have the required PLPD, they can collect full Michigan No-Fault benefits from the insurance company covering the negligent automobile or truck. Because of the nature of the motorcycle which exposes its driver to the harshness of the road and the severity of impacts that can occur from this exposure, the injuries involving motorcyclists are frequently catastrophic. Full No-Fault benefits including medical, lost wages, household services, and medical transportation, are available to the motorcyclist if they are struck by an automobile or truck, even if the accident is the fault of the motorcycle driver. With all the exceptions and intricacies of the motorcycle involved in an accident, it is important to select a law firm that has specialized knowledge in these matters. Not only do the Southfield attorneys of Wigod & Falzon have this knowledge, but their managing partner, Lawrence Falzon, is an avid motorcyclist himself, being the proud owner of an Indian Chief. 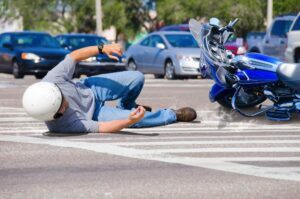 Call us now for a free consultation if you have been involved in a motorcycle accident. Remember-you pay us nothing if we do not recover for you!